This weekend is completely open... good thing... I think we'll be hanging around the house. Jack is a sick boy!! Cough and cold...feeling pretty lazy... ! That's sounds like a good reason to plop on the sofa, watch tv, sew.... and be a couch potato!! I'll get a pan of lasagna ready for Jack's dinner then I'm on a sewing date until midnight... my girlfriend and I are headed to Cinnamon's to sew and eat! This huge white cabinet.... it has screen doors on the front!!! How wonderful is that? 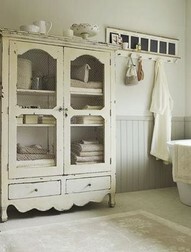 I think it's adorable in this bathroom... PLUS it would be superb filled with antique quilts! YUMMY!! This one is more reasonable in size...and see how well it holds the antique quilts! Luscious! Now... I need to tell you...there is nothing better than RED! Jack used to laugh... every time I asked him to paint anything for me (to sell in the store)... he would say... I know...don't tell me... you want it RED! If it was RED... it sold immediately. Isn't that a neat bit of information? I love the screen on this door too. 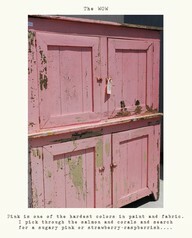 Ha...now this is a Pepto Bismol cabinet!! My friend Susan A would love this...right Susan? I love it too... !!!! 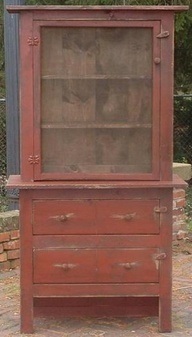 This wonderful corner cupboard is the absolute best to decorate! They too are great sellers!! I love to open the door like they have done and hang a quilt on it... then the top of the cabinet is begging for something ... don't you think? Simply Marvelous!! 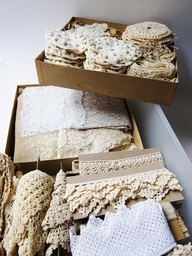 Here is another love of mine... old lace! It just speaks to me when I see it...know what I mean? I wonder where it came from, who made it... I love to decorate with it too. 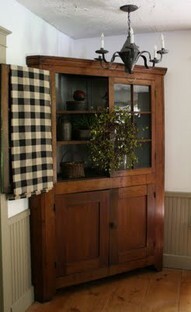 Not the "over-decorated" look as in the Victorian era... but just a touch of it here and there. It's so warm looking hanging over the side of an antique basket filled with a wonderful silk arrangement... or sewn on to the bottom edge of pretty bath towels (the kind you hang for "pretty" purposes and don't actually use them...hahahahaha). It's always a "HOT" bidding item at the auctions too! These are soooooo cute. You find jars that you love and then spray paint their lids to fit your decor! Let's see... these would be so cute in your sewing studio...one filled with old wooden spools, one with old lace, one with antique clothespins...hhhmmm.... 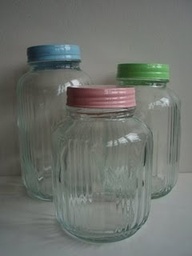 I'm going to have to keep my eye out for these type jars... love them! Hey...look at this... I don't know why I've never thought about this... you use your melon scoop and empty the center of a cucumber...then you fill it with yummy chicken salad! Doesn't that sound good...nice and cold and crispy... Delish!! And here is our favorite little friend. I think I have shown this fellow before... but you know...it's the Halloween season and he just had to pop out again (HA... no pun there). What a funny thing to have in your yard. I'll bet you would get a ton of cars driving by...don't you think? 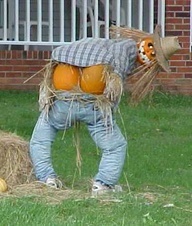 I'm surprised no one has made a woman with her shirt open and these pumpkin "girlies" showing! OOooops... I might have given some of you an idea...sorry!! Okay... I'm off to make some hot tea for my honey!! He feels like crud... man I hope I don't catch it... I've got too much going on to get sick.... aspirin here I come! Have a super weekend... and get a bunch of sewing done! I will sure be working on it!